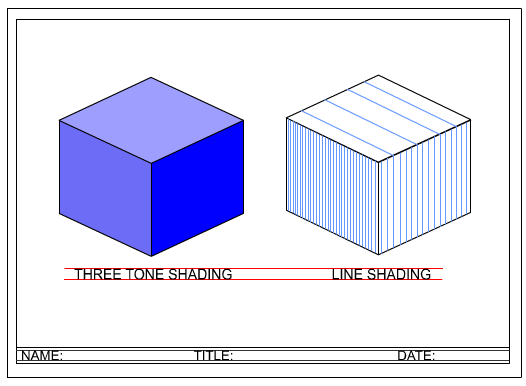 Isometric drawing is way of presenting designs/drawings in three dimensions. The example below has been drawn with a 30 degree set square. Designs are always drawn at 30 degrees in isometric projection. It is vital that drawing equipment such as T-squares and 30/60 degree set squares are used carefully. The drawing paper should be clip securely to a drawing board. 2. Draw guidelines to help start constructing the left and right sides of the cube. Remember to use a 30 degree set square for the 'angled' lines. 3. The top of the cube can be drawn quite easily by using the set square to draw one edge of the top and then ‘flipping’ it over to draw the other. Draw two cubes using the 30 degree set square. Then add colour and shade using the simple shading techniques shown below. Set out the paper as shown below.